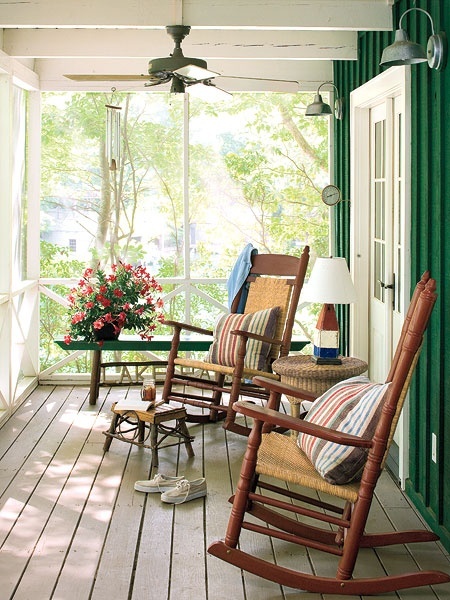 Ah the porch…a place to enjoy a crisp breeze and literally take the time to smell the roses. I do believe that world peace can be obtained while swinging on a porch swing…I wonder if that has been tried yet? 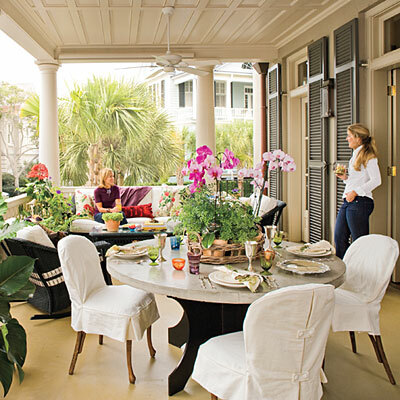 Well today we are going to take a peek at a smorgasbord of these hospitable spaces. 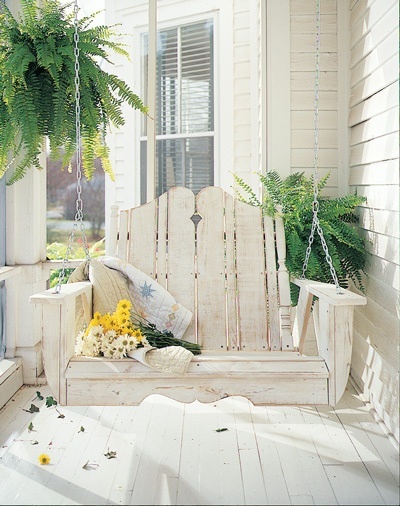 It’s all about Porch Decor! It doesn’t matter what your style is…there is something here for everyone! There is a ton of inspirationand maybe one of these perfect places might just give you a BRIGHT idea! 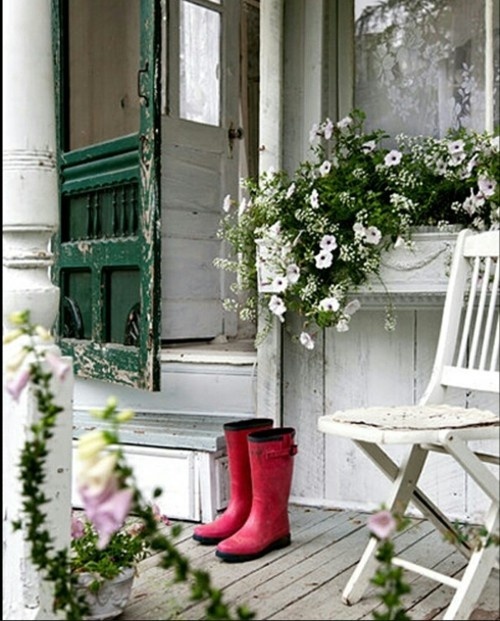 Well if there is one thing that I have noticed while exploring different style porches is that bringing the inside out is a big trend in decorating your porch! Here’s a great example of just that. 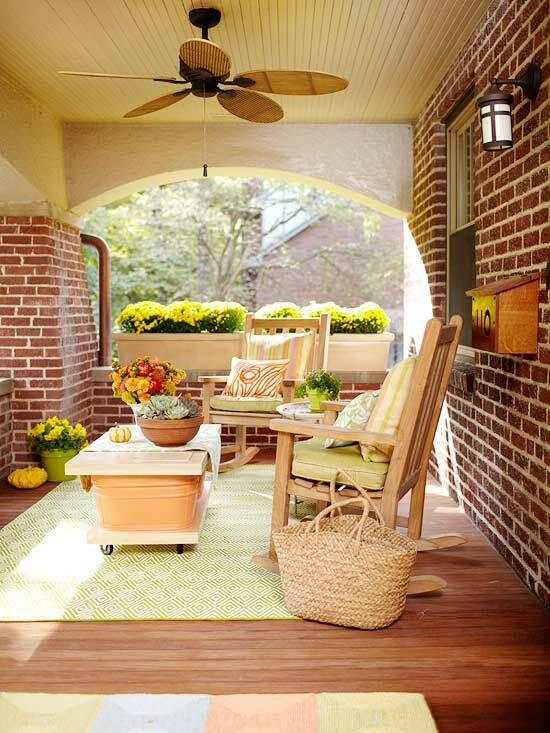 With a few outside rugs, a few mismatched pieces of furniture unified by paint…some pretty folding chairs and loving touches this perfect porch is complete. There are just so many possibilities. 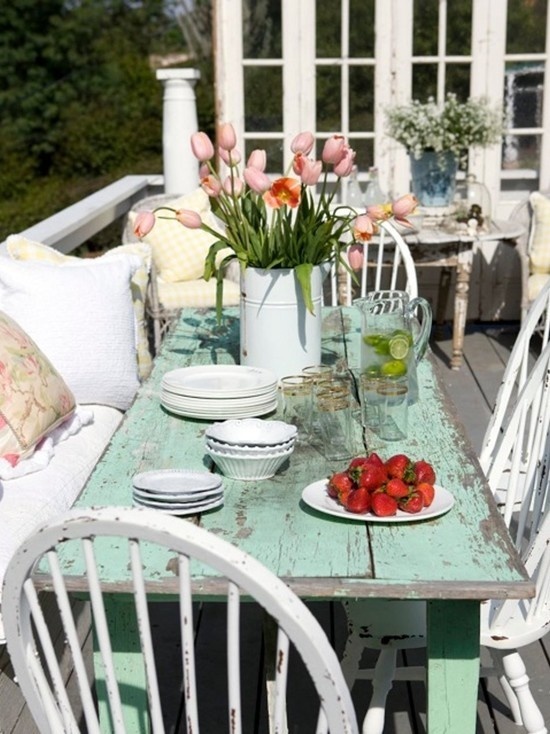 A nice large farmhouse table is a great beginning, extra distressing is compliments of Mother Nature. 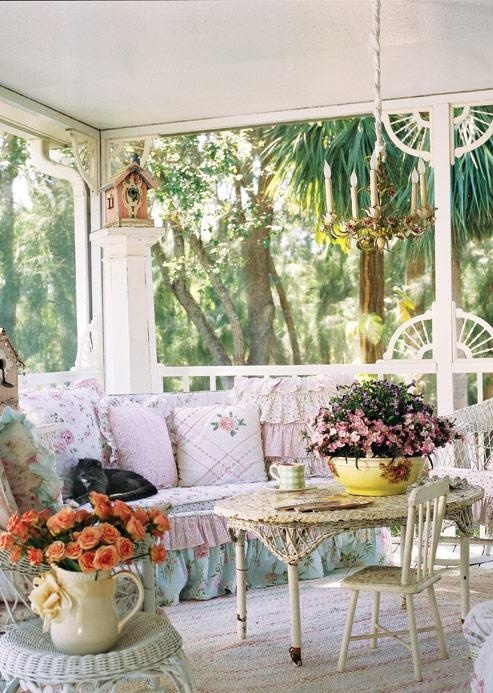 This shabby chic porch is a great place to gather and enjoy family and friends and was brought together by random pieces of furniture. Now having a porch with a roof is an extra bonus! White washing is always wonderful…I just love this inviting table with all the pretty touches…you can have your personal style shine through. Oh what a great place to relax…read a book…enjoy the fresh air! 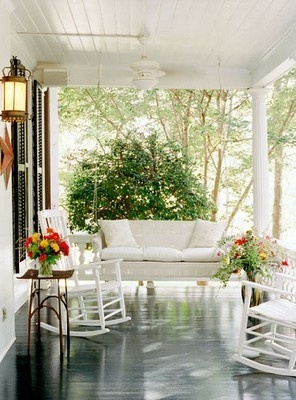 I hear from my friends from the South that a porch is not a porch without a swing and this one is fabulous! 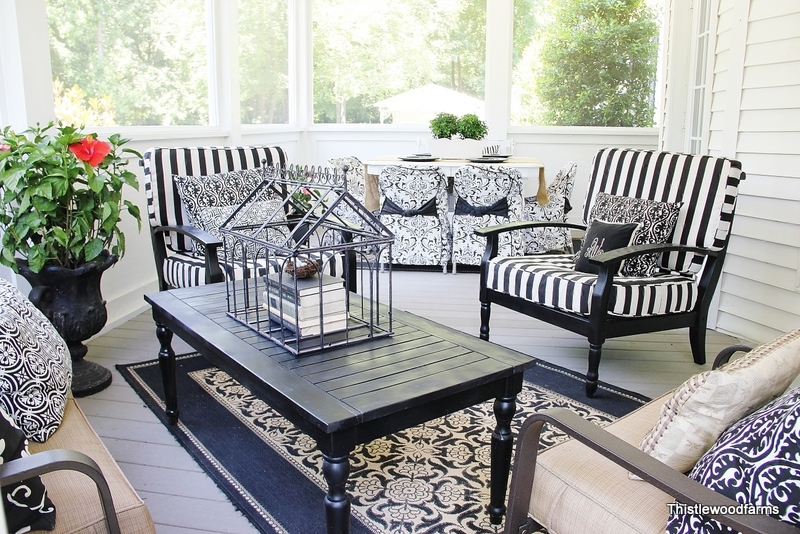 Using a black floor to compliment the shutters and white to blend seamlessly with the home…this porch says home sweet home. Talk about all the comforts of home! 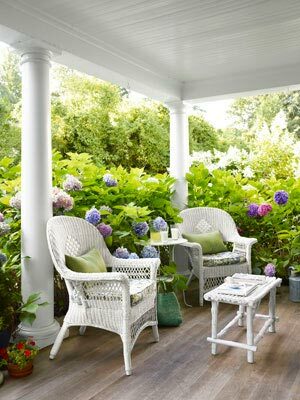 Using wicker which is easy to move is a great idea because I think when the elements get a bit out of control…you have to move these pretties to a safe place. One way or another…this space is inviting to all and an extension of the home. 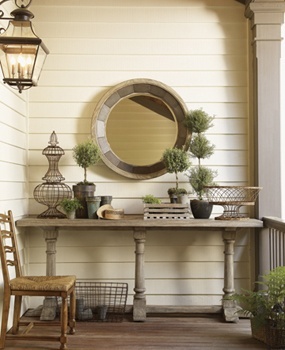 I have to say that I never thought of using a mirror on the porch…but what a great entrance into the home! 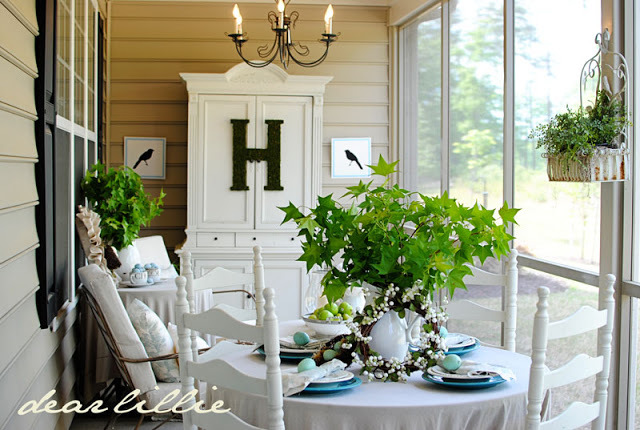 This must be tons of fun to decorate with the seasons and special occasions! 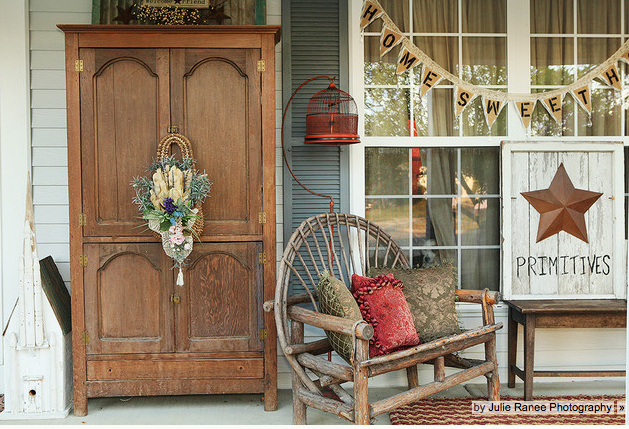 If it is more of a country primitive style you are looking for to show your flair…why not bring an armoire onto your porch. I would make sure that it was in a safe place on a porch with a roof…but it does look great! Of course this one has a roof and screening to keep everything safe from the elements. It is simply amazing! where Kentucky charm and hospitality awaits you. I suddenly feel like having a mint julep! 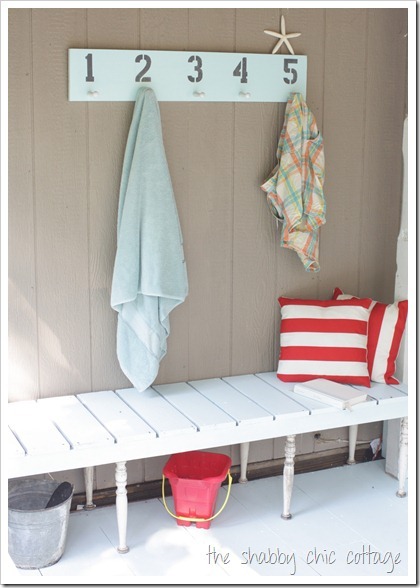 No matter what the size of the space you can make it special…here at The Shabby Creek Cottage, Gina gives you a beachy welcoming touch even though she is in the heart of Tennessee! It also has the perfect spot for a refreshing treat. 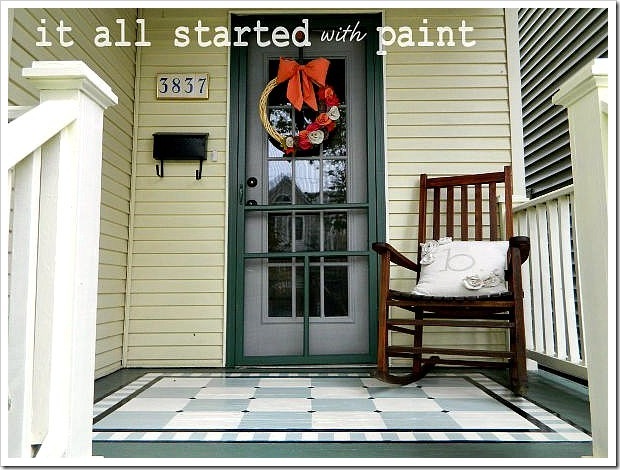 Now over at it all started with paint…the porch has a rug that is just incredible and what makes it even better is it never has to be rolled up and brought in…why? It is hand painted and spectacular! 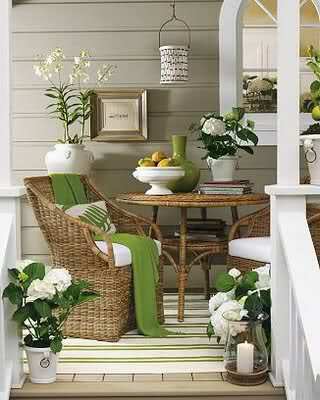 Wicker once again is a great for outdoor decor. 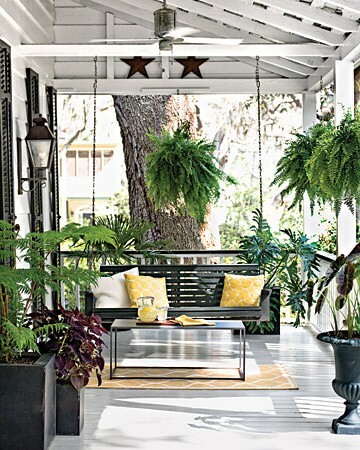 Given the foliage…I think this porch experiences some beautiful weather all year round. I love the brick floor. Here’s a great space…fresh and fun and check out that coffee table…looks like a pretty easy one to make yourself. 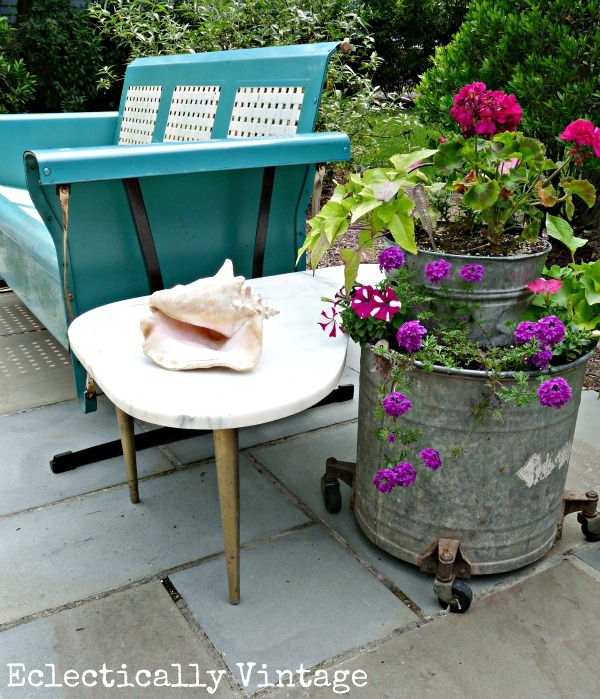 Two pieces of wood…casters and 2 cool steel buckets…getting any ideas? 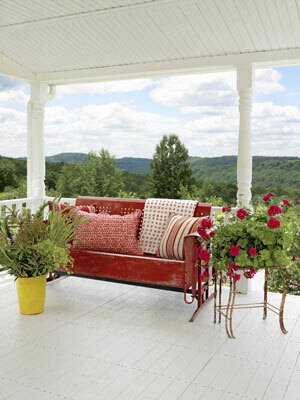 Ah…the day bed is a spectacular idea for those closed in front porches! 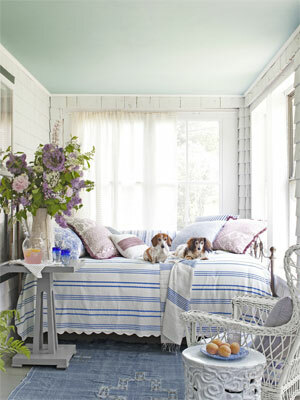 Ok…I admit it…I chose this one because it was adorable but really…it has two dachshunds on the bed…how cute are they! What a comfy space that anyone can create from the heart and without breaking the piggy bank! This vintage metal slider sure has character and looks amazing overlooking the mountains. Then with the POWER of pillows it is escalated to all new heights! 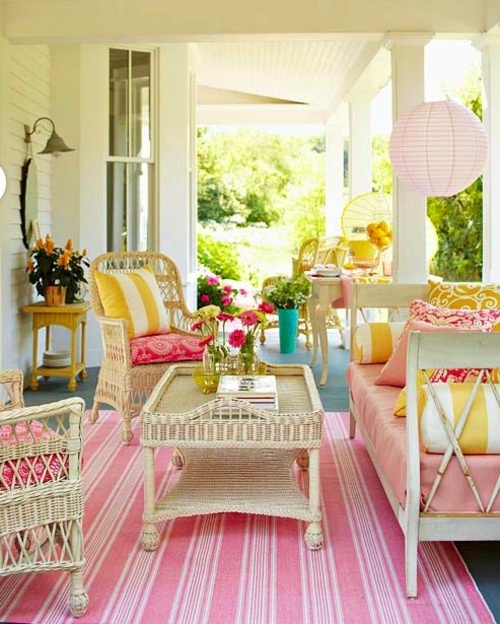 If color makes you happy…have a go at it on your porch! This space says that HAPPY people live here! Oh what a simple paper lantern can do! White and cheery! You just can’t go wrong with wicker! 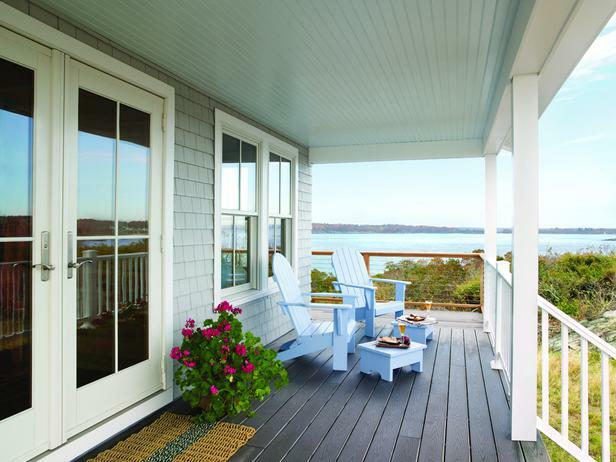 Love it…another metal slider…it looks awesome on this beautiful beach porch…it just SCREAMS…Jersey Shore…I feel the sand between my toes and the salty breeze at my face! Check out all the little accessories…so much fun! she scored one that is awesome and looks amazing. Black and white…the classic combination that always looks amazing. With the simple change of a pillow or two…the mood and style changes instantly. This is a traditional but modern look! 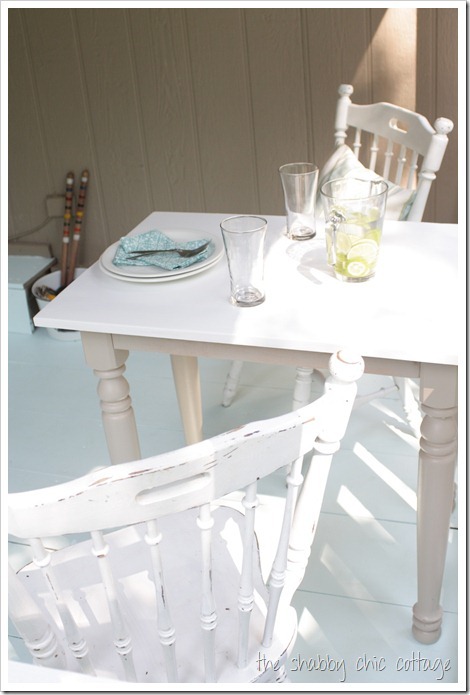 2 Rocking chairs…some simple furniture and you are good to go! 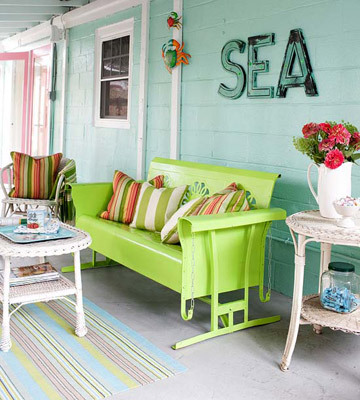 How about a Colorful Coastal Porch! 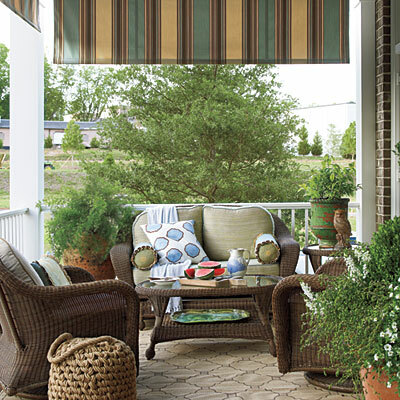 Here’s a cozy space and having the large coordinating fabric shades allows you to go wild on your decorating…it can stay in place all Year long! The Adirondack chair is sometimes all you need. Such a cheery place and check out those shutters…love all the little touches that combines a modern feel with traditional lines. Entertain a lot? Want to be outside? 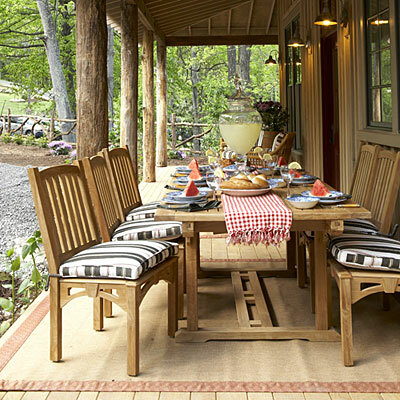 Enjoy the fresh air and share a meal…bring the dining space out to the porch! Here is another gorgeous gathering place…a place where you can enjoy your family and friends…watch the kids play while you have a cool refreshing drink…enjoy a meal…it’s dreamy! I also think adding the ceiling fan is BRILLIANT!!! 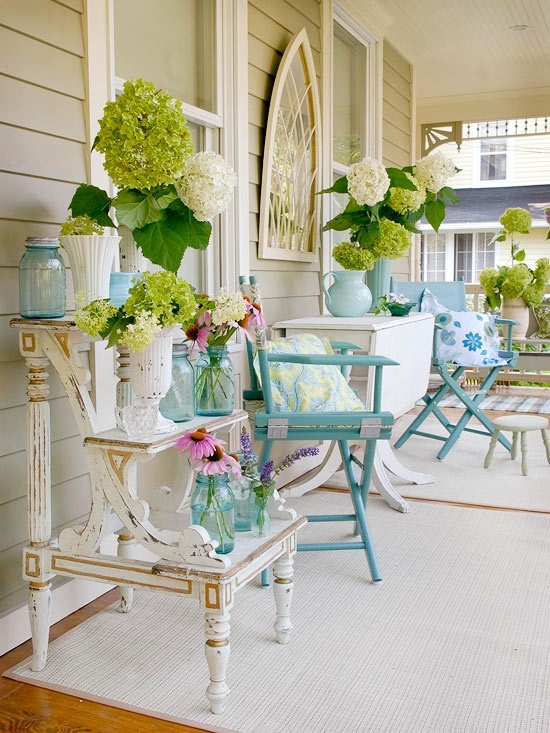 Sure hope that this little selection of varied styled porches may give you some great ideas for your own porch…one thing is for sure…make it your own…there is no right or wrong…the skies the limit!!! We will be checking out many more outdoor spaces in the next month…so stay tuned! Wonderful inspiration, Andrea! Thanks for the ideas! 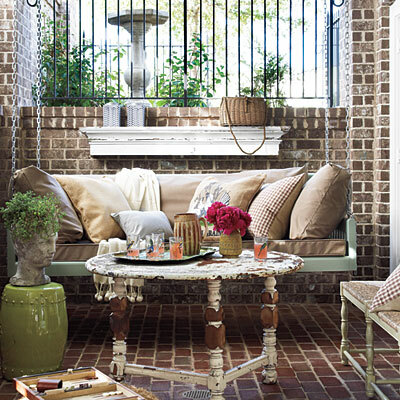 Dreaming of summer sitting on my glider sipping margaritas – thanks for including my patio! L-O-V-E these, Andrea! I could enjoy a glass of wine on any of these!! Hope you’re enjoying the weekend, friend! These are great ideas. I pinned them so when I have a house one day, I can have inspiration to decorate my porch. Such amazing inspiration! 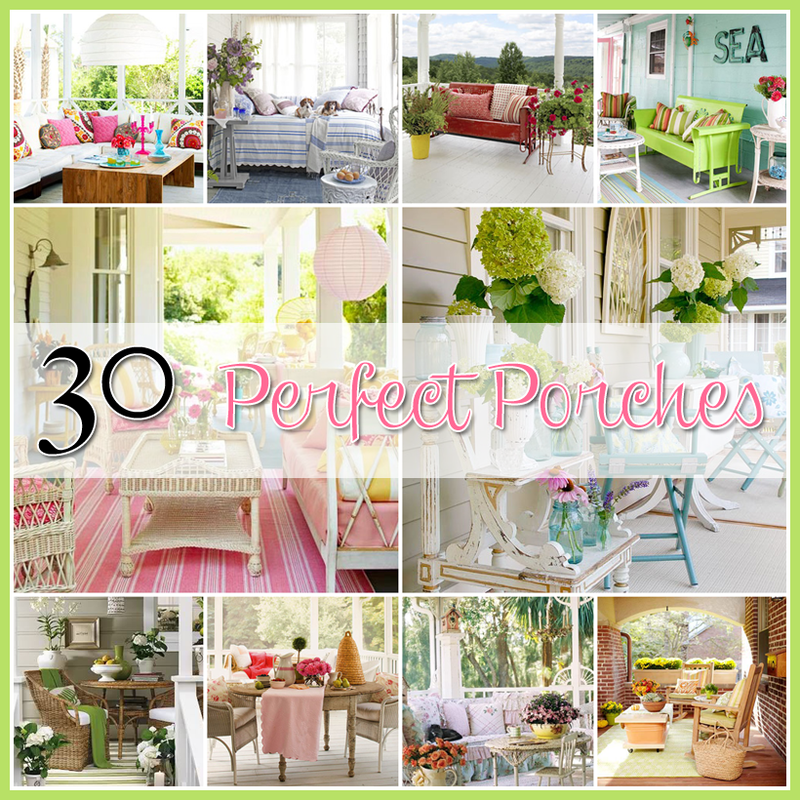 And thanks so much for including me with so many fabulous porch projects! Now if it would just stop snowing so we can enjoy our porches! How I wish I still had mine! Love all the inspiration!! Great ideas! 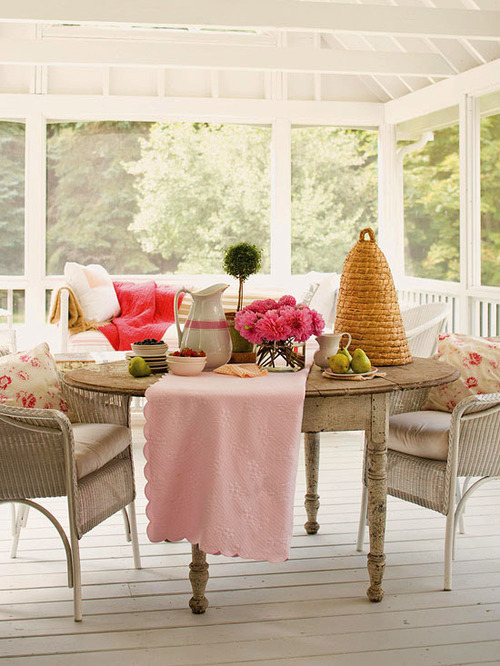 I am currently planning a freshen up of our small covered porch trying to use items I already have and then maybe a few new accents. Thanks for the inspiration. Nothing better then a great ftont porch! Hope u are having a great week!